I love shooting superheroes. Normally, I'd shoot Spiderman and Batman quite differently: Batman is a creature of the night, Spiderman is a daytime hero. However, for this team-up, the shadows won out. This is a composite. 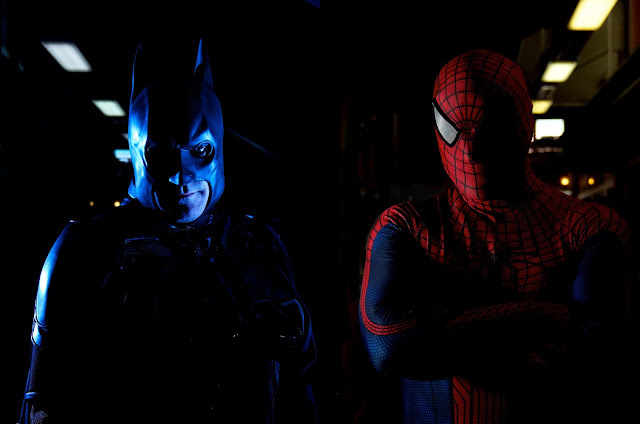 I shot Spidey and Batman on the same occasion, but we had to cut the session short, so I didn't get to shoot them together, this time around. We had this nice, long corridor, flashes and a speed grid, but no umbrellas, so it was a hard light kind of event. Batman and Spiderman are from Superheroes against cancer. I have photographed them on several occasions now, and look forward to doing it again.